Fantastic! Thanks for sharing this. The potential is there and I particularly liked your conclusions and things that can be improved for the next storystream. Very helpful Rob! Very interesting post, that links well to what we have been trying to do at http://storytlr.com. I suggest you have a look and see if it could support your use cases. Hi Robert, you can also try using http://www.MediaTuner.com. Users can upload videos to YouTube and they can tag each video with a unique tag. Photos can be uploaded to Flickr, tagged with a unique tag, and Tweets with a specific #tag. All media elements will display either automatically or manually (moderated by you) in a embeddable MediaTuner Player. Great for Events, Breaking News and LiveStreams. What a great idea. I might try Posterous for my blog. Why not push this content out to relevant blogs in the area too? I write a blog called http://www.fieldtripswithsue.com. It's about inexpensive things to do in and around metro Atlanta. I get a good bit of traffic from the AJC's blogs. It dawned on me last week, that I could be sending a good bit of traffic to AJC as well. My blog is an award winning blog, but I do it on the side. I don't get paid and I actually have a real job consulting plus three kids. Not much time to really research the stories. But the AJC's Inside Access has recently had some fantastic “Know Before You Go” stories and the writer Jamie does a great job of bringing in the knowledge of other AJC writers. I started making comments on my posts sending folks there for more information. I'm not sure they get the link juice that way, but it's a start. Newspapers should look at local blogs as the teaser for their more in-depth stories. It might also be worth putting some advertising dollars on specific blogs to generate traffic back to specific sections and/or newspaper blogs. I like it. It's a slightly different presentation, but I like the interactivity. Only just finding out about your storystreaming experiment from August 30 (a little behind on my RSS reading)–and I love it! 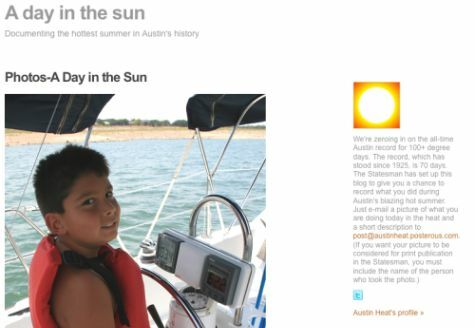 What a thoughtful use of Posterous' anyone-can-contribute functionality; plus, the photos are simply outstanding! This already has me kicking around some ideas for something similar at an upcoming Social Media Breakfast. Thanks for the inspiration. Also, Shel Holtz (@Shel on Twitter) was raving about this project on the Monday, September 7 edition of the For Immediate Release Podcast. Here's the link to the episode page: http://budurl.com/FIR2009Sep07 Start at the 21:28 mark. Thanks for posting this link, Bryan. I wish I could scroll directly to that mark, but it doesn't seem like I can! Open it in iTunes or the audio program of your choice, and then scroll forward. I'm still a old-school blogger at heart, but I like Posterous. It's fast and carefree – and it has great functionality and an easy interface. Hard not to see lifestreaming going more mainstream in the years to come. Did an experiment at the SunSentinel with our teenlink reporters covering Obama's school speech and it went pretty smoothly. We hit a little snag because they treated it like a blog and sent too much text, but I will definitely be trying it again. Thanks for the post. Did you use your regular blog platform, Seth, or more of a storystreaming platform?